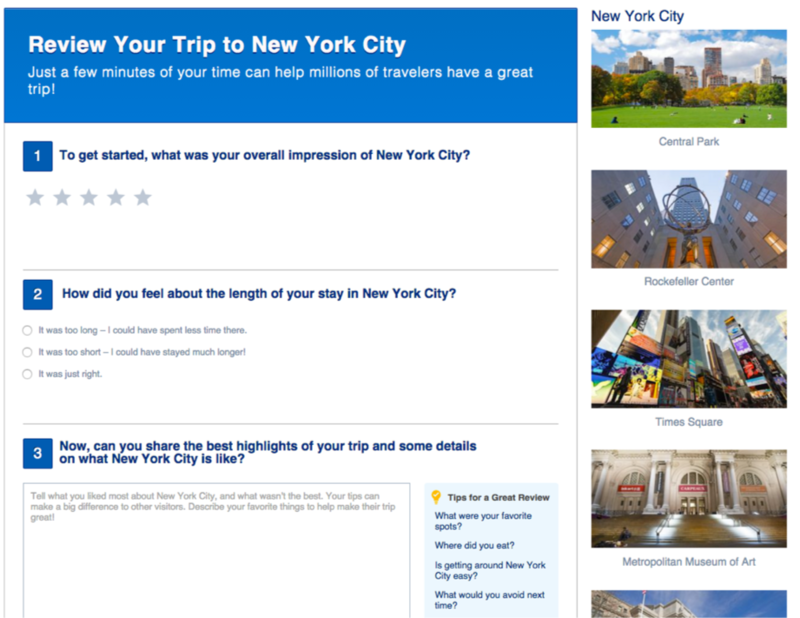 Booking.com had traditionally asked its customers to review their accommodations after their stay. At some point, the company also started asking some simple questions about the destination in addtion to the hotel. The way it was presented was not ideal. Once customers had reviewed the accommodation and submitted their review, they were then asked two "bonus" questions. Would you recommend *destination* to other travelers? What did you like most about your trip? Customers were surprised to see these questions after submitting their accommodation review. This second review was required and there was no way to opt out, so the resulting feedback was often 2-3 words in lenght. The majority of the destination reviews lacked context and were not helpful to other travelers who read the reviews. 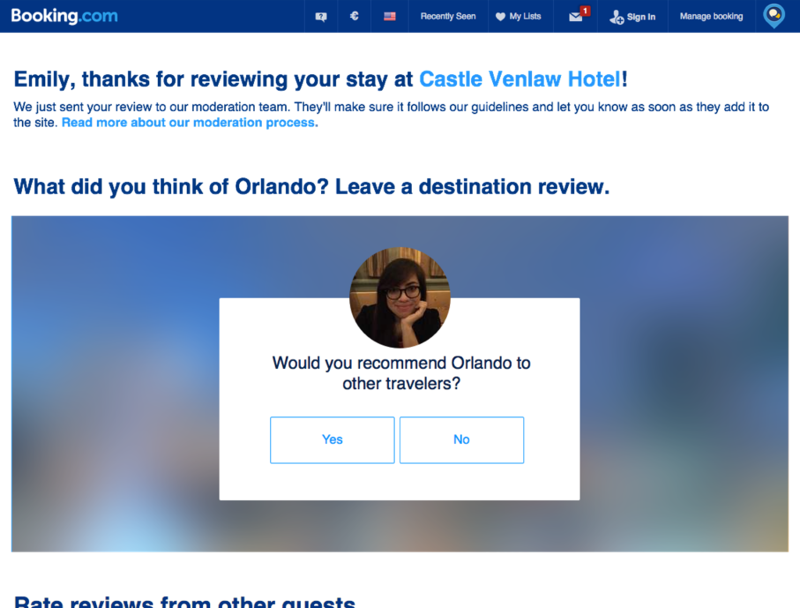 In an effort to improve the collection of destination and ultimately attraction reviews, a newly formed team was created to shepherd all user generated content (UGC). Some of our customers did not trust our accommodation reviews. They felt that we only showed the positive ones and supressed the negative ones. Facebook, LinkedIn and Medium are the gold standard for collecting user generated content, so we looked at them and a few others to try and understand their strategies. Our first step in creating a new desitnation review expereince was to decouple it from the existing accommodation review form. We knew that this could reduce the number of submissions we would receive, but our hypothesis was that the quality of reviews would go up substantially. The idea was that if a traveler decided to review a destination of their own volition, the review would be much better because they had something they wanted to express and not because they were simply forced to do so. People are busy these days so they are very choosy about where they expend their efforts. On top of that, writing reviews can be daunting. There is so much that one might want to say, but it can be difficult to know where to start. We thought that one of the ways LinkedIn handled this was really interesting. Specifically their approach to endorsements. The idea of quickly endorsing multiple people in a rapid fire manner until a person decides that they didn't want to do it anymore seemed promising. What if we applied this same approach rating destinations and attractions? Ratings are simple enough, but we also wanted our customers to provide more in-depth reviews about the places they visited. Our strategy was to break the information we wanted to collect into groups based on the level of cognitive load they required from review submitters. 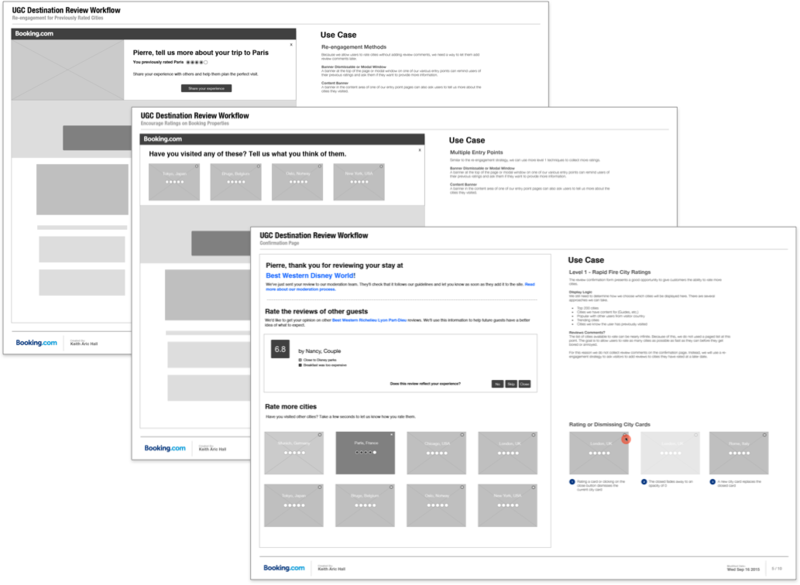 These elements could be presented individually at specific times or all together in one review form. 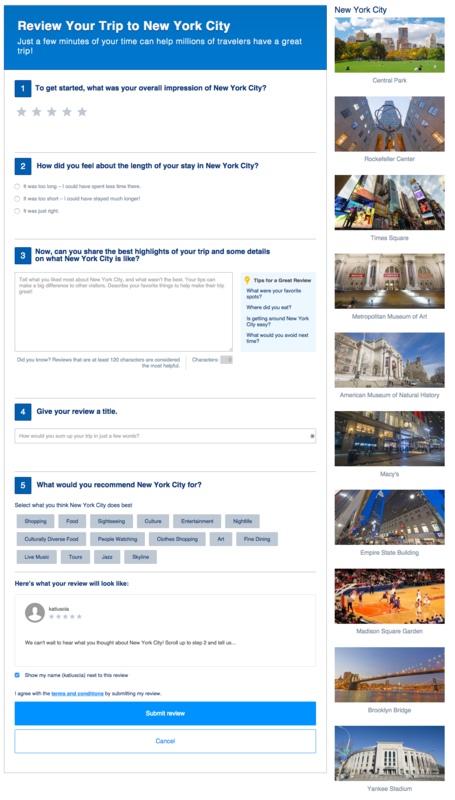 For example, we could ask a number of questions about a destination (making sure to mix the level of effort) and on later ask logged-in customers to quickly rate attractions they may have visited in a city they reviewed. The third part of our strategy was to open the gates to destination review submissions. As described previously, we would only ask for destination reviews after a customer submitted a hotel review. We wanted to address the potentiality that by making the destination review voluntary, the number of submissions would drop. 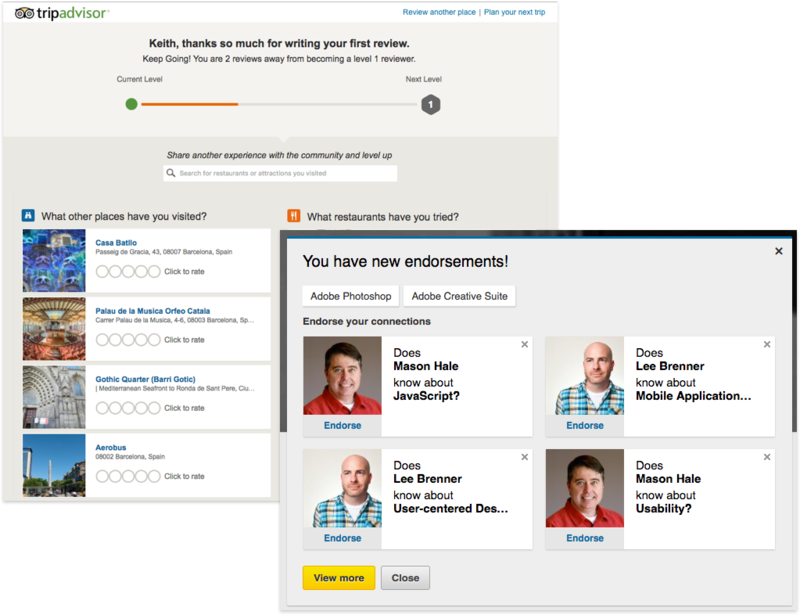 To mitigate this effect we decided to solicit reviews in multiple places: personalized emails; notification banners on the homepage; member dashboard. We created a prototype and tested it with travelers in London. The initial design was uncluttered and had plenty of white space. We hoped this would help make the form feel less daunting. One of the surprising pieces of feedback that we received is that the form felt unfinished. Usability test participants felt that it was too plain. Many participants expressed that our competitor's review form felt easier than the design we presented. They reported feeling like they were moving faster or accomplishing more on our competitor's form even though it had more questions. What we discovered was interesting. 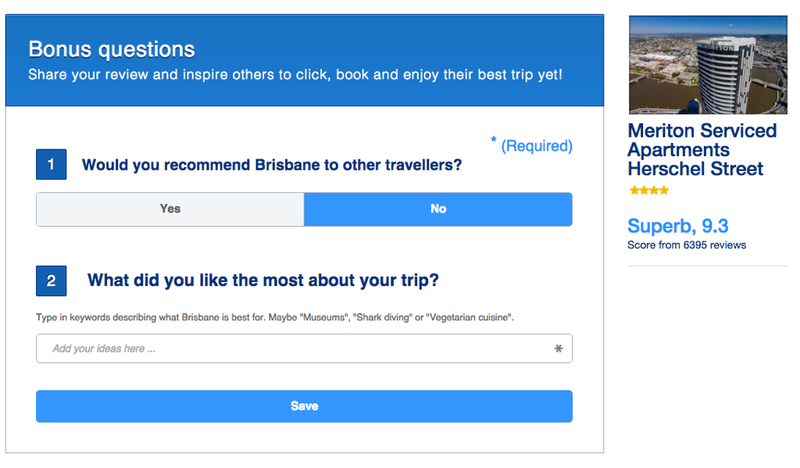 Our competitor's for had only had a couple of open entry text fields, while most of the questions were a mix of ratings, yes/no or predefined choices from which to select. In contrast our form mainly consisted of an open entry text field for users to write whatever they wanted. Participants found the "empty page" daunting. By providing a mix of question types, our competitor's form gave participants a sense of accomplishment because the non-open entry fields allowed them to more quickly move through the questions. Staring at an empty text area gave many of our test participants anxiety. Many reported that they just weren't sure where to start in describing their visit to a city. To help ease this anxiety, we decided to add a prompts and some photos of the top attractions in the respective city. To our amazement, the new form outperormed the old one handily. The results were proof that our 3-part strategy of making the form voluntary, varying the level of effort, and increasing the number of entry points more than adequately addressed our goals.